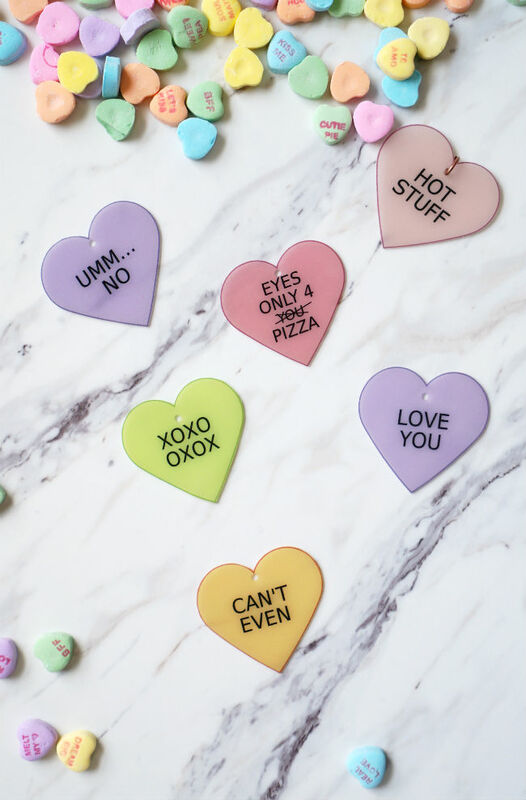 I really want to like conversation hearts. They’re cute, they’re colorful, they’re festive, but honestly they taste disgusting. Even the smell of them kiiiinda makes me gag. Every year I try to like them. I buy different brands; I try to add them to things like my coffee to see if anything can make them tolerable, but so far I’ve just been left with disappointment and gross coffee. This year, I’ve officially given up, accepted my distaste and opted for a non-edible version. 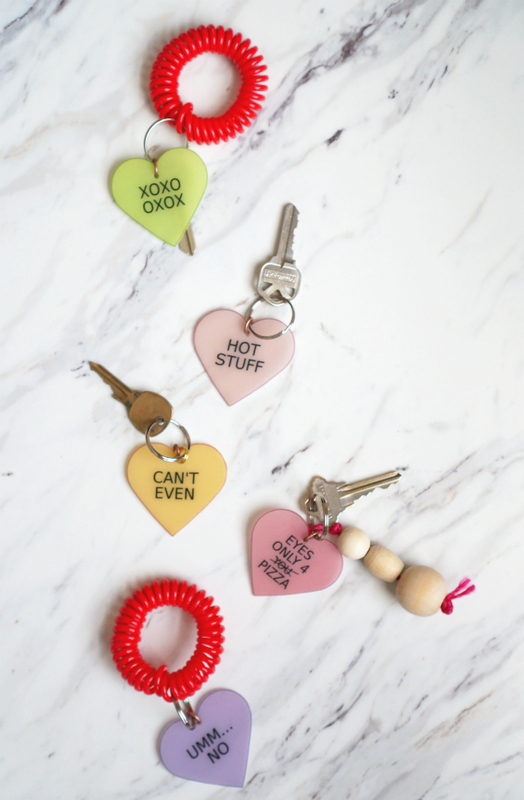 These DIY conversation heart keychains are actually super easy and can be done in an evening after work (2 hour-ish). They’re made out of clear, shrinky dink film that takes any design, whether printed or hand written and after a few minutes in the oven, turns it into a small, hard piece of plastic. They’re super cutesy and give the whimsical feel of Valentine’s day without the sugar. I’m planning on sending these little baubles as Valentines for friends near and far. Gather: Grafix Clear, Inkjet Shrink Film, An inkjet printer, Scissors, Jump Rings (found in the jewelry section of your craft store), a needle nose pliers, and key rings. Optional: a permanent marker. You’ll also need: A template. I’ve made three options for your to download – one that’s kinda funny, one that’s more on par with the traditional conversation heart, and one blank on for you to write in your own message. 1. Download one (or all) of the templates from above. 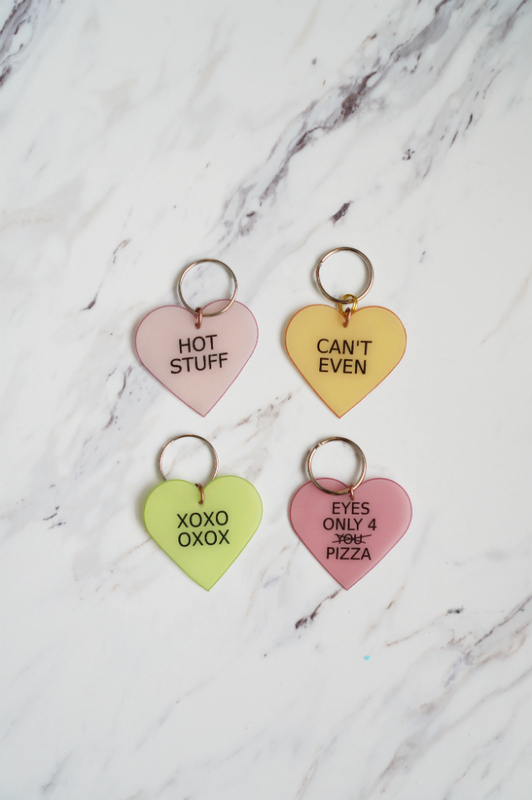 You’ll notice the template hearts are much larger than the final keychain. The hearts will shrink by about 50% in the oven! 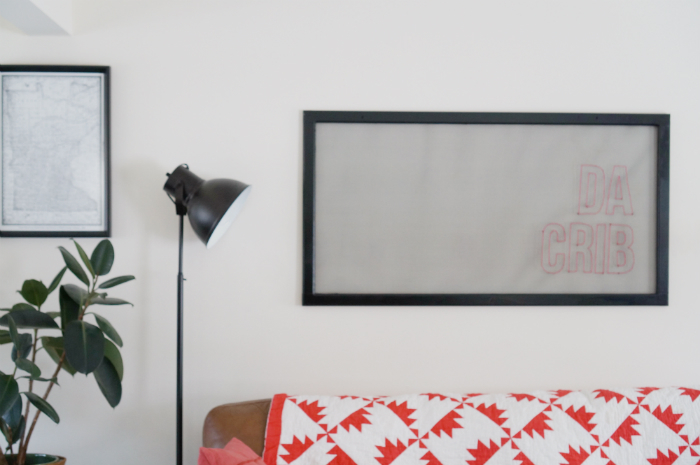 If you want the end result smaller, simply print the template at a reduced percentage. 2. Print out the template onto a sheet of the Grafix Clear Inkject Shrink Film. Tip: I don’t have a fancy-schmancy printer and the shrink film must have been a little too heavy to move through my basic ink jet printer. First, make sure your paper settings are on transparency. I even had to trick it by taping the shrink film to a regular sheet of paper to get it to move through the printer correctly. 4. If you want to write anything additional, simply use a permanent marker and doodle to your heart’s content. 5. Punch a hole in the film. This will be your key chain hole so make sure it’s near an edge. 6. Preheat the oven to 375 degrees and prepare your pan: take a bake sheet and layer parchment paper, your heart, parchment paper. The shrink film will tend to curl in the oven – which is normal, but this will help keep it as flat as possible. 7. Bake at 375 degrees for 4 min. Your oven might be a bit different than mine so start with one of your hearts or a scrap piece of film to test. Take it out when the heart shrinks and is approximately 50% of original size. This could range from 2-5 min. My lucky number was 4, but again, test with your oven first. 8. 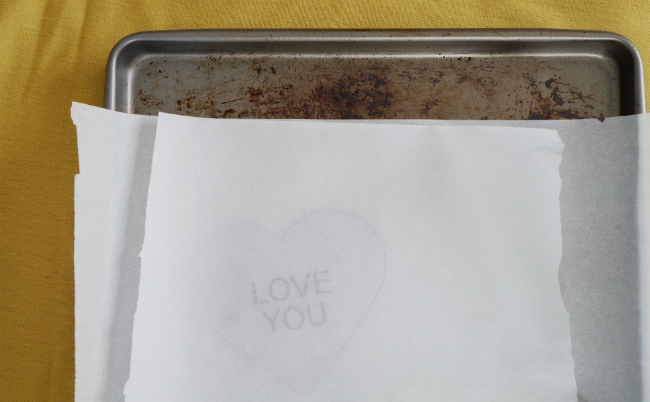 Take out of the oven and immediately place a book on top of the hearts (don’t remove the parchment paper). This will flatten them completely. They will be cool to the touch 2-3 min. after taking them out of the oven. You’ll now have little plastic hearts. 9. Next you’ll assemble the actual keychain. Using the needle nose pliers, you’ll pull apart the jump ring, insert it through the hole in your plastic heart and close it. If you’ve never worked with jump rings before, here is a great tutorial. 10. The jump ring acts as a ring to connect the key ring to. 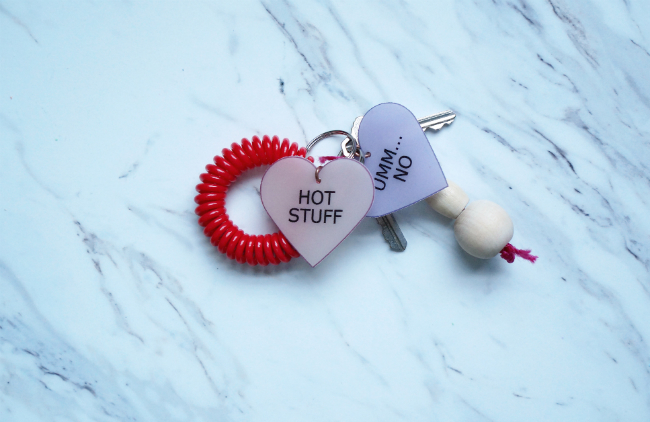 Simply slide the key ring through the jump ring and tada, you have yourself a conversation heart keychain! 11. Attach keys and baubles.